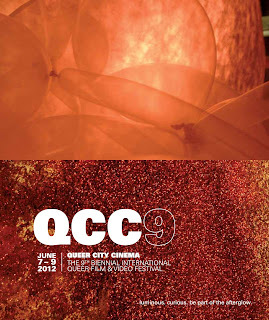 "The Magus" has been selected to screen at Queer City Cinema, the 9th Biennial International Queer Film & Video Festival, in Regina, Saskatchewan, which runs June 7 - 9, 2012. It will screen as part of the Short Film Program 3 on Friday, June 8th @ 7:00pm at the Neutral Ground Gallery (1856 Scarth Street). Queer City Cinema (based in Regina, Saskatchewan, Canada - The Queen City) is the largest and oldest ongoing queer arts festival between British Columbia and Ontario. This biennial festival was initiated in 1996, and saw its 8th installment in June 2010. A total of 77 artworks were exhibited, screened and performed at QCC 8, representing 97 artists from twelve countries. Upcoming festivals include Performing Out Festival 3 (October 5-8, 2011); Media Arts Festival (June 6-9, 2012), and Audibly Out Festival 3 (January 30-February 2, 2013). Jaimz Asmundson is a Winnipeg-based media artist, working primarily in film & video and most recently in expanded cinema performance. His award-winning work has traveled to film festivals worldwide, including a retrospective and residency in Cologne, Germany and he was called "Winnipeg's enfant terrible of transgressive cinema" by Antimatter Film Festival. Jaimz is a member of the WNDX Film Festival, a past programmer of the Gimli Film Festival and he has also contributed to many award-winning shorts, features, documentaries and tv productions as a picture editor, assistant editor and graphic designer. © Jaimz Asmundson. Powered by Blogger.